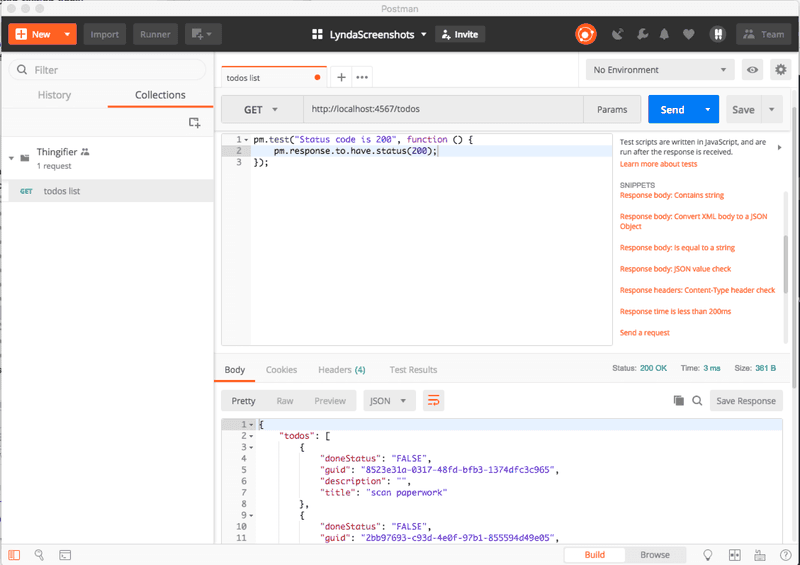 Postman supports our manual interactive testing of REST APIs by allowing us to create requests, send them to the API and then we can look at the response to see if the API call worked as expected. A lot of tools do that. This code checks that the status of the message is 200, meaning Success. And when I send the request. The code will run and the results will be shown in the Test Results tab. 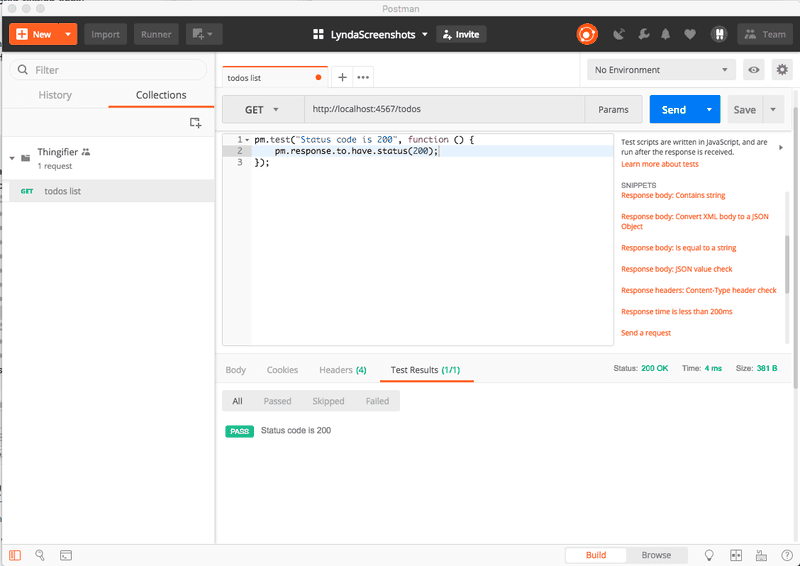 support exploratory testing by asserting on common assertions* move toward more automated validation of your application by using the Postman runner. To create a set or requests which are automatically sent and the assertions reported on. * You can even add this into a Continuous Integration process if you want to. This post has a supporting video that you can find here, or embedded in the post below. I’ll create a simple request to support this tutorial. a GET http://localhost:4567/todos request on my test application returns a JSON response with two todo items in it. This is hard coded data in the application so it will always be there when the application first starts up. Check other conditions based on the state of the application. I can create assertions in Postman using the snippets functionality without knowing much about how to code. When I have the “Tests” tab selected. I can use the snippets on the side to have Postman automatically add code into my Tests. In the snippets I can see “Status code: Code is 200”, when I click on that Postman will add code into my test. We can add this test without needing much coding knowledge, but we do have to learn to read the code. If I read this it means. I can use this, without amending the code, and postman will assert that the status code is 200. We should receive a 404 from the application and the Test Results will be red and show us the number of tests which have failed, and we have only added one. And we can see it has failed. I can add a basic content type header check without coding, by selecting “Response header: content-type header check” from snippets. And if we read it it says. But this doesn’t assert on the value of the header so I can’t check that it is “application/json” as we are expecting. I need to write some code to check this. 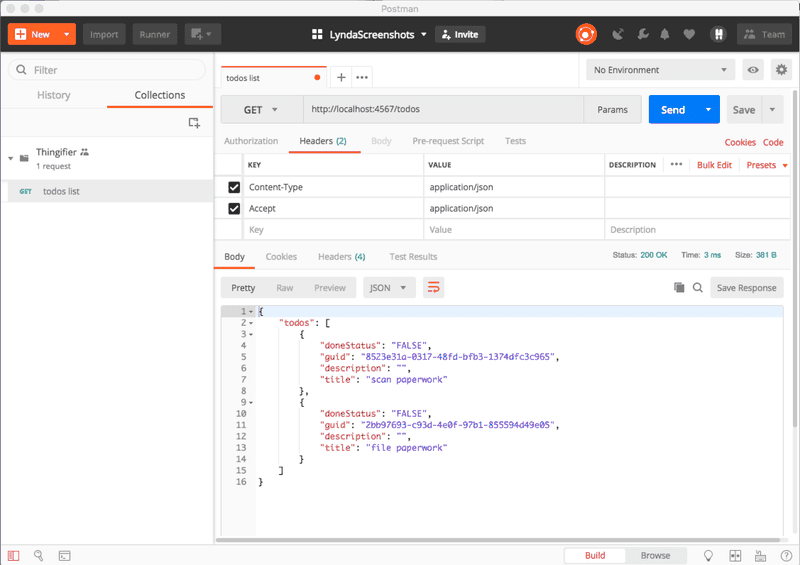 Snippets can help you get started with assertions in Postman. The assertions are useful when you are performing exploratory testing and want to have something monitor invariant assertions as you test. i.e. stuff you expect to always be true for the testing you are performing.